This is my second post on Diego Rivera. 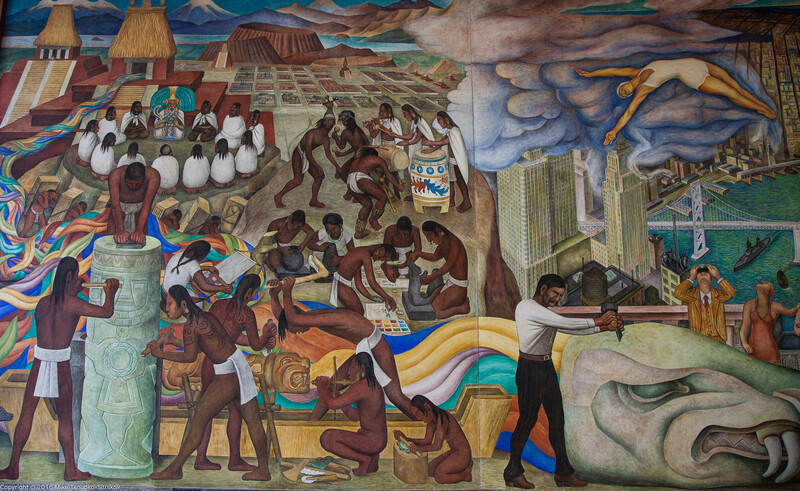 I previously touched upon on his life and art in my post Diego Rivera in Mexico City. So we picked a weekend and drove up to the City to check out those murals. Address: 50 Phelan Avenue, San Francisco, CA 94112. Look for Diego Rivera Theater (GPS coordinates 37.727355, -122.451256). It was Saturday morning in mid-July, so the Ocean Campus of the City College of San Francisco was as deserted as a college campus gets at that time. 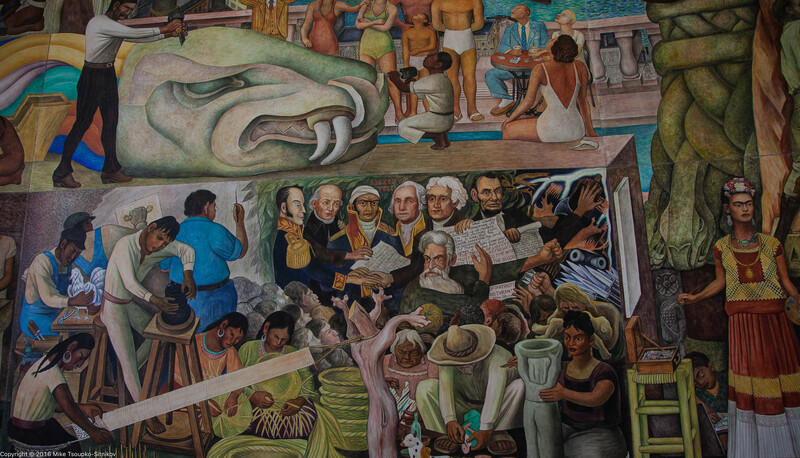 It took us about 5 minutes to locate the Diego Rivera Theater where the mural is displayed. To our relief the door was open, and we were greeted by a young man who apparently was on duty. He had a small desk with a laptop set up right next to the painting, and he probably was one of the students either volunteering or earning a few extra bucks. He was very friendly and knowledgeable and told us a few interesting facts about the mural, and answered our questions. 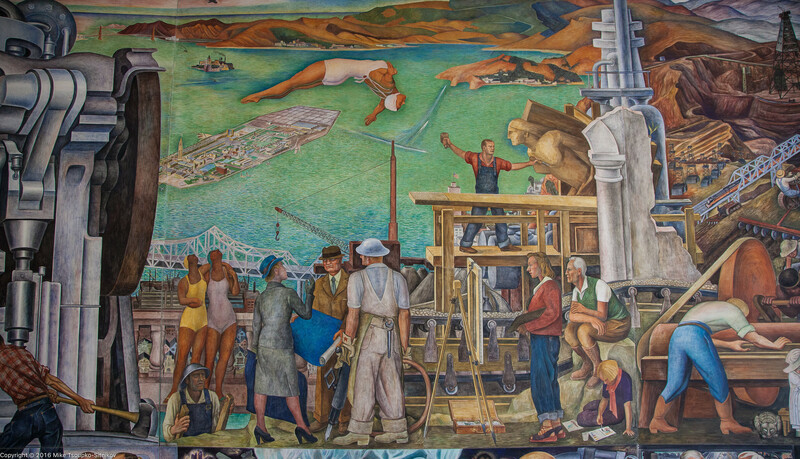 Pan American Unity, or as its full title says, The Unity of the Artistic Expression of the North and South of this Continent, is the mural that Rivera painted during his stay in San Francisco for the Golden Gate International Exposition in 1940. After the expo the mural was donated to City College of San Francisco. The painting is about 22 meters (74 feet) wide and over 6 meters (22 feet) tall and occupies the whole wall of the Theater. The theater has a gallery at the second level that allows to view the mural from a higher point, but the distance from the gallery to the painting is so small that it is not possible to view (or to photograph) the whole painting at once. Like most Rivera’s works it is fun to watch, reading it one fragment by another, recognizing places, personalities, allegories and the memes of the time. Let’s pan slightly down and to the right, and we see more of artists at work, as well as some prominent revolutionaries and politicians of the New World. See the man in blue shirt and pants, painting, with his back to the viewer? This is Diego himself, making a cameo appearance in his own painting. Also note the woman in a red-and-yellow dress on the right? She has the face of Frida Kahlo, Diego’s wife and a prominent artist herself. Frida and Diego Rivera, by Frida Kahlo, 1940. SFMOMA. Address: 800 Chestnut Street, San Francisco, CA 94133. San Francisco Art Institute is easy to find at the above address. The entrance is directly from the street. 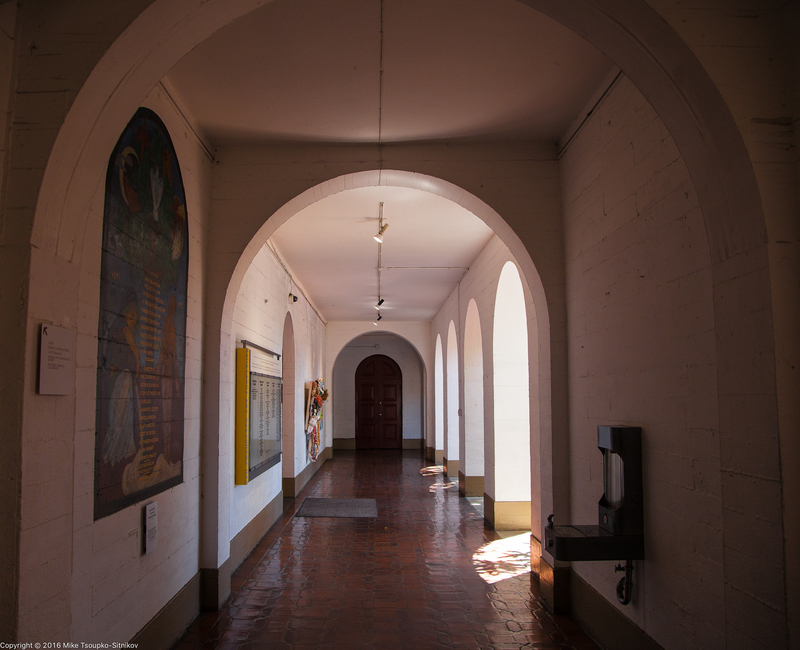 The building itself is an interesting one, reminiscent of a convent, with courtyards, cloisters and galleries. It has several open terraces at the back that provide spectacular views of San Francisco Bay. 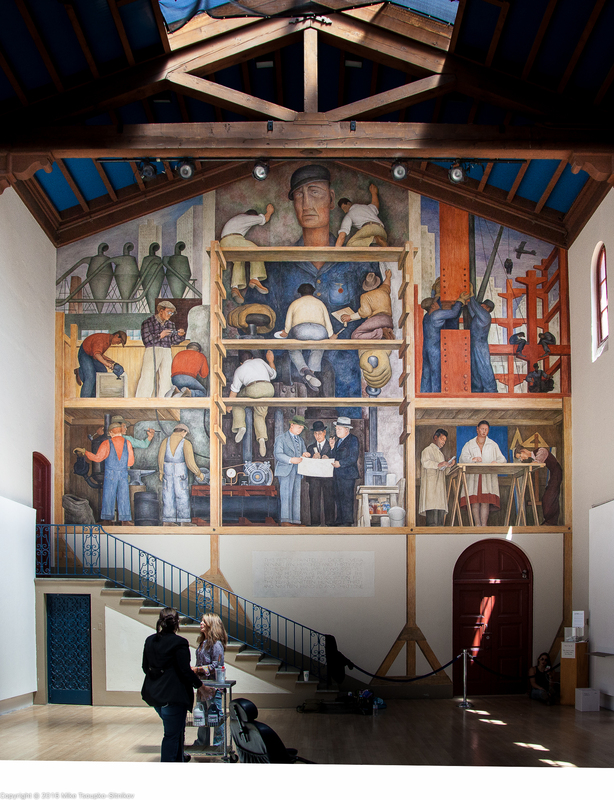 The mural itself occupies the front wall of Diego Rivera Gallery – a hall with a high vaulted ceiling and an opening in the roof letting the light in. The fresco itself is not just a fresco – it a fresco about making a fresco. It was painted in 1931. Some of the characters in the mural are prominent San Franciscan architects and artists of that time. There are also a few anonymous workers show doing their jobs. An the painter in the center sitting with his back to the viewer with the brush in his right hand and the palette in his left is Diego himself. Unfortunately we were not able to see that fresco. We showed up at the reception of Stock Excange Tower on Saturday, and were told that the fresco is open for public viewing only during certain hours on first and third Mondays of each month, if I remember it correctly. We’ll plan a visit some time soon, and I’ll update this post if we get to see the painting. There are also several canvas paintings by Rivera in San Francisco Museum of Modern Art.